FJY37 is part of the 2018 Super Treasure Hunt set and 4/10 in the HW Speed Graphics series. It is a Spectraflame black sports car decorated with red stripe graphics. “Borla” is on the sides and “Since 78” is on the hood and rear fenders. 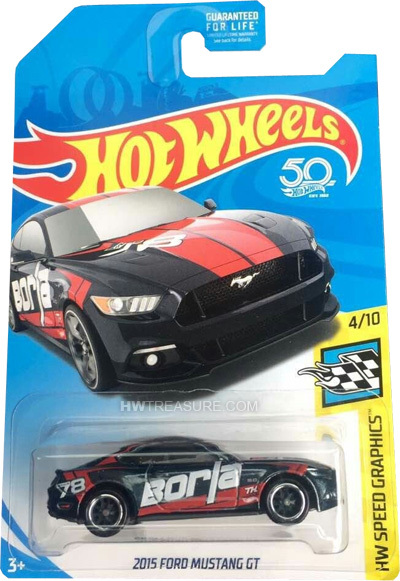 The Hot Wheels logo and “TH” are by the front wheels wells. The car has tinted windows, a gray interior, Real Rider wheels, and a black plastic Malaysia base. 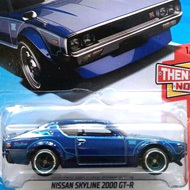 This vehicle can be found in mix “D” of 2018 Hot Wheels mainline cases. The GT made its debut in the HW City – Mustang 50th series. It is based upon the sixth generation Mustang.